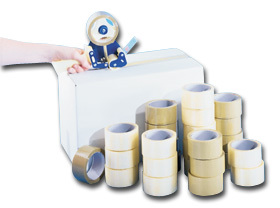 Poly tape holds boxes together even through rough UPS, freight or postal handling. Goes on fast with handy dispenser. Reduces pilferage - once tape is pulled off, tape cannot be resealed. Resists moisture, chemicals and oil. Stands up to temperature extremes. Super adhesion to corrugated, board, paper or metal. Meets all postal and O.S.H.A. regulations. Meets Fed. specs. PPP-T-70, A-A-1684-A. FOB Shipping Point.